Battered by allegations of animal mistreatment, barred from breeding more orcas, and beset by frequent protests, Marineland is a theme park with few friends. Thankfully for the beleaguered Niagara Falls attraction, their generous ad budget means that Bell-owned radio stations won’t contribute to the pile-on in their hometown. Hosts of three southern Ontario radio stations were ordered to not express any opinions about the troubled theme park on air, because Marineland does so much business with Bell. “In light of Marineland opening and the ongoing controversy I want to make sure we’re all on the same page regarding this client,” program director Sarah Cummings wrote in a May 2014 email sent to radio staff, since obtained by CANADALAND. “I know there are many opinions but I am asking that you please refrain from talking about them on air. 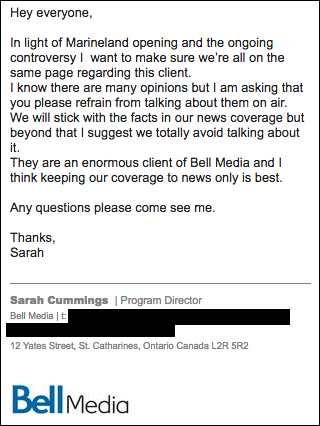 “They are an enormous client of Bell Media and I think keeping our coverage to news only is best,” she wrote. One of the stations with hosts ordered not to talk Marineland is the only talk radio station for the region, 610 CKTB. Hosts at the music stations 105.7 EZ Rock in Niagara and 102.9 K-Lite FM in Hamilton were also sent the directive. Cummings did not respond to multiple requests for comment, nor did the hosts who were sent the email. As always, we’ll update our story if any of them do. The memo also directs staff not to engage with any discussion of Marineland on its website or on social media. This all but eliminates talk of the park’s troubles by several major radio stations in the region. EZ Rock is the highest rated station in the region, according to stats posted by Kowchmedia. Bell owns three of the seven stations in the region, and they draw more than half of the area’s listeners. Marineland has been accused by former staff of mistreating their animals. The amusement park has vigorously denied all the allegations and is suing for defamation former staff who have spoken out and the Toronto Star, who published a sprawling investigation into allegations of poor conditions at the park. Marineland has also threatened to sue CANADALAND, for airing an episode where former animal trainer Phil Demers spoke of the abuse he alleges he saw. The Star’s investigation details the plight of a number of marine mammals, several who have since died, who suffered from a variety of ailments, thought to be caused by poor water quality. Last year, the Ontario government passed a law prohibiting the park from breeding any more orcas, sometimes known as killer whales, in captivity. The law also banned the sale of orcas in the province. It doesn’t prohibit, however, the sale and purchase of other marine mammals. This isn’t the first time Bell Media management has attempted to suppress news content that conflicted with its business interests. Former Bell Media president Kevin Crull ordered staff not to put CRTC chair Jean-Pierre Blais on air, after the regulator ruled cable and satellite companies would have to unbundle their TV packages. The so-called “pick-and-pay” decision infuriated Crull to the point of calling the head of CTV’s news division to keep Blais off camera, according to a Globe and Mail report. Afternoon shows on CTV News Channel, which is owned by Bell, cancelled planned interviews with Blais. However, the 11pm newscast on the main network featured an interview with the CRTC chair, in defiance to the edict. UPDATE (July 18, 3pm): Since the memo was sent in May of 2014, Marineland has been a topic of discussion on CKTB, the talk radio station. This includes an hour-long interview with the former trainer Demers, which aired in February of this year. It’s unclear whether this was done because management dropped its edict baring Marineland discussion, or if it was conducted in defiance of the memo. If we receive comment from any of the involved parties we will update accordingly.